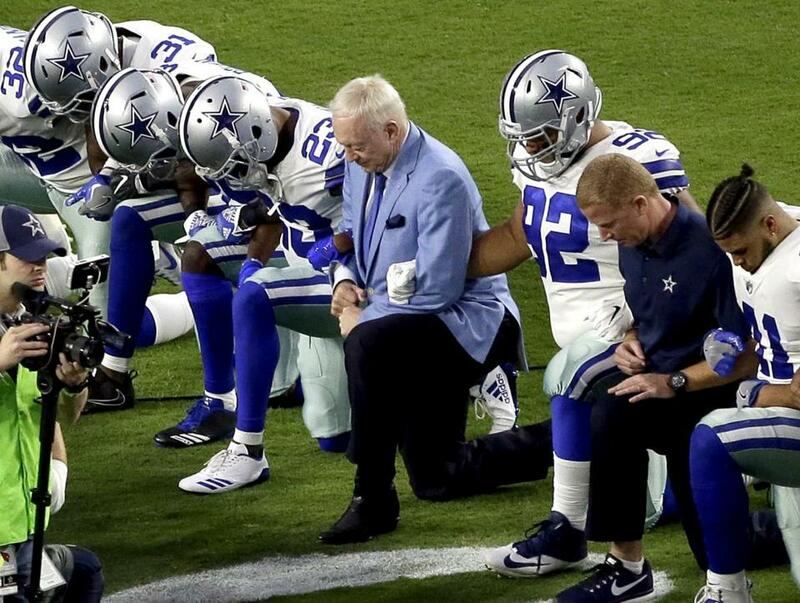 The Dallas Cowboys, led by owner Jerry Jones, center, took a knee prior to the national anthem Monday. WASHINGTON - President Donald Trump resumed his sparring with the NFL early Tuesday, asserting there was the loudest booing he ‘‘had ever heard’’ when the entire Dallas Cowboys team dropped to its knees ahead of the national anthem at a game Monday night near Phoenix. ‘‘Great anger,’’ the president said as part of his latest series of tweets on a national controversy over views on protest and patriotism that has raged since Trump’s first blast late last week. The president also claimed that ratings for the NFL were ‘‘way down except before game starts, when people tune in to see whether or not our country will be disrespected!’’ But traditional rating metrics have shifted in recent years as more viewership migrates to mobile devices and streaming services. Some in the crowd booed at the display, which Jones later said was ‘‘a statement about unity and . . . a statement about equality.’’ Arizona players also stood and linked arms during the anthem, but they did not take a knee beforehand.